You probably spent a week or two in high school learning about optics, occasionally finding relief from lectures in illusions projected onto the whiteboard. In my case, public school budgets meant that the projectors were routinely dim, out of focus, and off-color. The examples yielded an anemic crop of effects that lasted a few seconds. What little knowledge I acquired in class was muddled and superficial: cones and rods got “fatigued” and “adapted” in response stimuli, creating afterimages. Our retinas translated photons into electrical signals, which, after being “processed” in various parts of the brains, emerged miraculously as non-electrical visual experiences. Little did I know, it gets so much better. Disclaimer: This article has been identified to potentially trigger seizures for people with photosensitive epilepsy. Reader discretion is advised. YouTube and more generally, the internet paired with a computer screen, offer the chance to revisit these visual experiments and the scholarship behind them. You can turn off your lights, turn up the brightness on your screen, and experience robust optical illusions. Some even come with the exciting disclaimer that effects can last months. For centuries, debates about what constituted seeing something and the role cognition (as opposed to unconscious processing) played, were limited by the opacity of how our mind worked. From the inside, experience comes as a pre-packaged all-in-one deal: if you look at your favorite book, you not only see it as an object distinct from everything else in your visual plane, but also as a host of memories and associations and information. Think of this as the madeleine effect. As a consequence, we tend to imagine perception as being divided. On the one hand there is the raw stuff of perception (an undifferentiated barrage of light particles hitting our eyes) and on the other hand there is the incredibly rich inner life that we have, neatly arranged and organized according to our ideas and knowledge. on the other hand, the incredibly rich inner life that we have, neatly arranged and organized according to our ideas and knowledge. 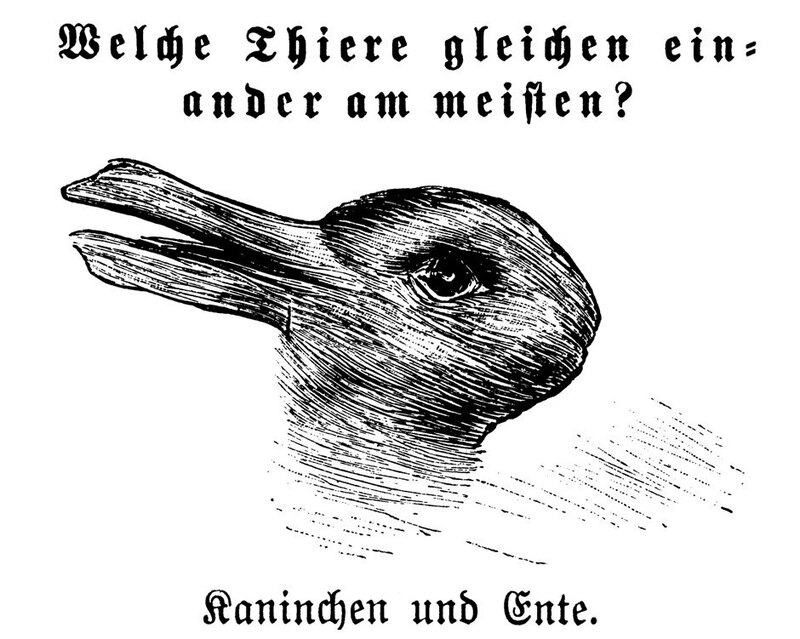 Wittgenstein in the Investigations used the famous duck-rabbit drawing to refine the role concepts play in perception. 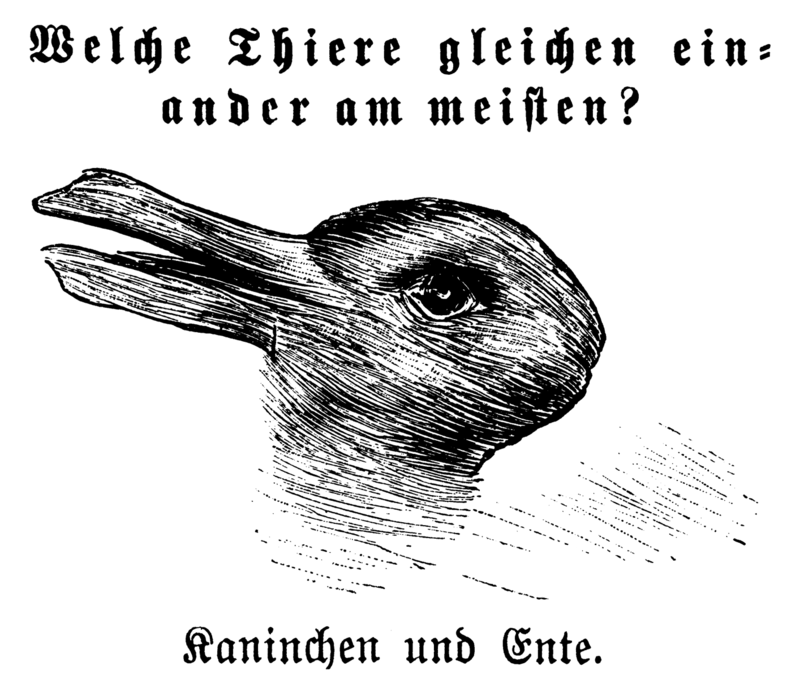 A person who has seen a duck but never a rabbit can look at the exact same image as you, but “see” something different, and if you took them to a rabbit farm and then back to the image, they’d have yet another different experience despite the object having remained the same. Somehow a change in knowledge—the acquisition of a concept of rabbits—alters the nature of the experience. Many philosophers, such as Tyler Burge and Jerry Fodor, have taken this insight, elaborated upon it, and concluded that all seeing is a product of conceptualization. While it is clear that concepts do play a role in our experience and, more importantly, the way we draw inferences from our experience, Ned Block argues that optical illusions give strong evidence that much of seeing is in fact the product of nonconscious factors. Moreover, to ignore the contributions of psychology in philosophy of mind is “a deeply wrongheaded armchair methodology” that leads to more confusion than clarity. The illusions below have been selected to draw attention to the ways our brain, outside of cognition, processes, packages, and labels visual experience. The following illusions play off of the way our brain translates a two-dimensional, undifferentiated barrage of light-particles, into discrete objects located in a three-dimensional space. These are more often associated (though not always) with what is called the “dorsal” stream of visual processing, the “where” component of seeing. As this process works by heuristics, it generally works well—we can reliably approximate the shape, size, distance, and speed of nearly everything in our day-to-day lives—but it’s also surprisingly easy to manipulate. For example, a re-creation of Escher’s endless loop of stairs that are simultaneously ascending and descending, is the result of using perspective (a two-dimensional visual cue) to disguise the nature of a LEGO castle. This effect becomes even more puzzling when motion is added, as is the case with Impossible motion: magnet-like slopes. The dorsal system is also what is tricked during the Willy Wonka-esque video, Quirkology's Assumptions. In this video, wooden balls roll up the slopes just as if they are pulled by a magnet. The behavior of the balls seems impossible, because it is against gravity. The video is not a computer graphic, but a real scene. But perspective is only one of the many cues our brain picks up on. The Dynamic Ebbinghaus effect (a non-dorsal stream illusion) uses motion and dynamic vs. fixed objects to produce the illusion that a circle is getting bigger or smaller. The last variation in this video was so convincing to me, that I even took a ruler to my screen to convince myself of the circle’s inactivity. Even relatively straightforward motion can be altered if presented in a field of lines, as the Pigeon-Neck Illusion demonstrates (try alternating between looking at the moving objects and the background). The illusion of growth can even be summoned by the mere use of line and shade, as this Autokinetic heart demonstrates if you keep your eyes very still at centered. The first clear specification of the motion aftereffect was by Jan Evangelista Purkyně (1820) who observed it after looking at a cavalry parade. Robert Addams (1834) reported the waterfall illusion after observing it at the Falls of Foyers in Scotland. While the above video works by desensitizing our eyes to motion, others work similarly for color. This castle image, for example, produces a genuine likeness of a realistically colored photograph, despite the fact it is a monochrome image. Similarly these alternating stars, if you stare exclusively at the center-point, do start to fill in red and green in otherwise blank spaces. One notably potent afterimage effect is the McCollough effect. If done correctly, it lasts far longer than the previous case-studies and involves both color and shape. It took me several tries (a total of nearly half an hour) to get it right, but when it works it really works. Unsurprisingly, the effect is quite difficult to explain. Luckily this video (a rare volume-on video) is narrated and gives you something to think about while you stare intently at a screen for 8 minutes. ← A demonstration of the McCollough effect. This optical illusion is similar to an after image effect illusion insofar as it involves complementary colors. It is different from an after image effect illusion in that it takes longer to perceive, but once perceived, it lasts for a much longer period of time. Interestingly, adaptation doesn't just apply to components of vision like color or motion. Ned Block led me to several experiments that show how even categories that have a high-level of social and cultural entanglement, such as emotional expression, gender, race, and individual identity, can be easily adapted into unconscious processing. 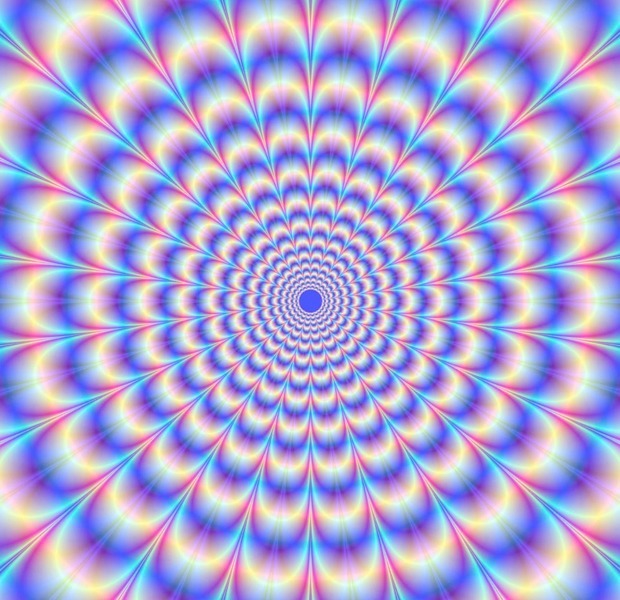 There is also a whole field of illusions which trace the unconscious connections between senses called multi-modal illusions. And while these are less easy to reproduce on YouTube, which can only manipulate sound and sight, the McGurk effect below is quite enough to remind us just how entangled the web of experience gets.